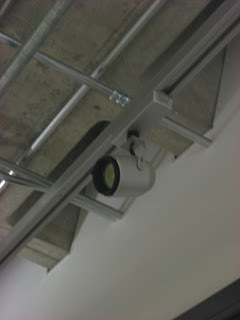 This is an HID fixture located on the third floor studio space in the Gatewood building. This fixture provides focal lighting. Since this bulb is part of a track system. The fixture is used to highlight work displayed throughout the space. This luminaire brings out warm tones to the areas it illuminates. I feel the HID bulb is appropriate withit the studio space. The luminaire provides the right amount of light for work to be displayed.